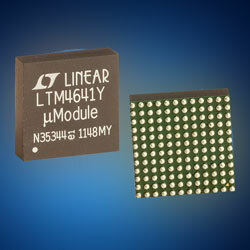 The new Power by Linear LTM46xx µModule power products from Analog Devices, is a series of POL regulators developed to decrease solution size and produce reliable power circuit performance. The regulators support step-down (buck), step-up (boost), and step-down and step-up (buck-boost) conversion with a broad array of feature and function combinations. The regulators are highly integrated SiP power management solutions that combine DC-DC controllers, compensation components, inductors, power transistors, and input and output capacitors. The devices provide control and monitor functions which include current monitoring, temperature monitoring, sequencing, and output voltage monitoring trimming, and margining. Offering efficient power system management, the regulators improve reliability by achieving controlled voltage accuracy, fault reporting and logging, and remote debugging.